More wonderful Mia Mariu products with my review! I received The Refreshing Foaming Gel Cleanser, The Anti-Aging Brightening Serum and The Anti-Aging Eye Cream. The Refreshing Foaming Gel cleanser worked wonderfully and left my face feeling clean and fresh. It started out clear then turned to foam as I rubbed it. Like it was a awoken. At first I was wondering how it would work as I have a dry face but with the Sea Kelp and Aloe it didn't bother my skin at all in fact it felt smooth. The other 2 work wonderfully as well, going on smoothly, feeling soft. With peptides, botanicals, aloe and B5 complex, the Anti-Aging Brightening Serum works well on fine lines and wrinkles as well as dark spots. It seems like my skin spot is lightening already but it will take time as it is noticeably dark. The Anti-Aging Eye Cream has Japanese Green Tea, aloe, vitamin B5 complex and E. It feels very light and blends in easily. All 3 products are oil free and work with all skin types. My face seems to have a more balanced look after using this trio. My cheeks don't stand out as much and my eyes appear less puffed out. Thankfully, we (great grandma, grandma, mom and Kayla (just a light touch to play dress up) have had the opportunity of trying a few of the great Mia Mariu cosmetic products. I seriously love, love their cosmetics! From the foundation to the lip gloss it is all awesome! Mia Mariu is the best Make. Up. Ever. There is no doubt it is the very best I have ever tried! Hands Down! I wish everyone of you could sample these. They are certainly wonderful cosmetics! Another of my faves we have tried is all four (4) of the Mia Mariu Luminous Lip Glosses! Dulzura, Tentacion, Romance and Illusion. Sparkling shine in a vitamin rich hydrating formula gives your lips an irresistible look. Contains Vitamin A, C and E to nourish your lips. The Mia Mariu Facebook Page states Mia stands for Beauty inside and out. Founded in 2008, their products are high quality, botanical based skin care treatment, nutritional supplements, mineral make-up, hand crafted make-up application tools, and fragrances. This statement is directly from their site. GIVING BACK By Mia Mariu Mía believes that every woman is a hero in many ways and with many people in her life. Her dreams motivate her to remain determined and focused but it is her tribulations that ignite her passion. Our goal is reach out and put a name to these amazingly beautiful women. Mía is a proud supporter of Wounded Warriors Wives, a program of Operation Homefront dedicated to recognize, inspire and comfort the women who sacrifice so much to care for our country's wounded warriors. We are committed to making their journey a little more pleasant, a little less alone and a lot more appreciated. Mom To Grandma believes this is just wonderful! I have never tried this before, but I really would love some of their lip glosses! This is a new product line to me, but if it help aging skin, now that I went to bed and got old overnight..(LOL) seriously, I do need some of the cleanser and antiaging serum. 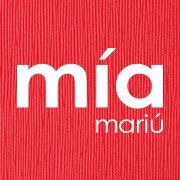 I would love to try out Mia Mariu! As soon as I am out of my current makeup, I am going to order some! Would love to try some of their lip gloss!! These products look great to try...also good to know part of the money is going to a good cause! I'd have to try it, to see if I liked it. I love that they are a supporter of Wounded Warriors Wives. What a great cause! I had never heard of them until this week. It seems a lot of bloggers are using them. Everyone seems to enjoy the results. Hopefully I'll be able to try them soon. I would love to try Mia Mariu products. I love lip glosses, beauty products, skincare....basically I am a beauty junkie!!! Nice to read that their products are high quality, botanical based skin care treatment. And they have mineral make-up.